Five years before Prince Harry proposed, Meghan Markle was already a fairy tale princess. The American actress, best known for her role as Rachel Zane on the legal drama Suits, guest starred as Sleeping Beauty in a 2012 episode of the crime drama Castle. In the episode “Once Upon A Crime,” (season 4, episode 17), Markle’s character kills a man in a hit-and-run while leaving a fairy tale-themed costume party. She then kills two witnesses to her crime, leaving them dressed as Little Red Riding Hood and Snow White. When sleuth Castle realizes she’s connected to the murders, Markle dons a Sleeping Beauty costume, drugs herself, and pretends to have narrowly escaped a fairy tale serial killer. She’s eventually caught and the episode closes with Castle and his partner, Detective Beckett, discussing the horrific consequences of the murders, as well as the appeal of fairy tales. In America, princes and princesses are creatures of fairy tale, like witches and unicorns. In Europe, they’re still a part of reality. 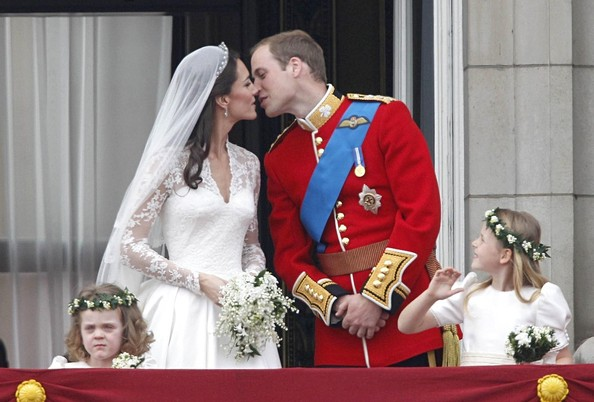 Royal weddings, especially British ones, are global television sensations. An estimated 23 million US viewers tuned in to Harry’s older brother’s wedding with millions more watching worldwide. When American actresses like Grace Kelly and Meghan Markle wed princes, the line between motion picture fantasy and royal reality blurs. Grace Kelly set the fairy tale wedding standard for generations to come when she married Prince Rainier III of Monaco in 1956. 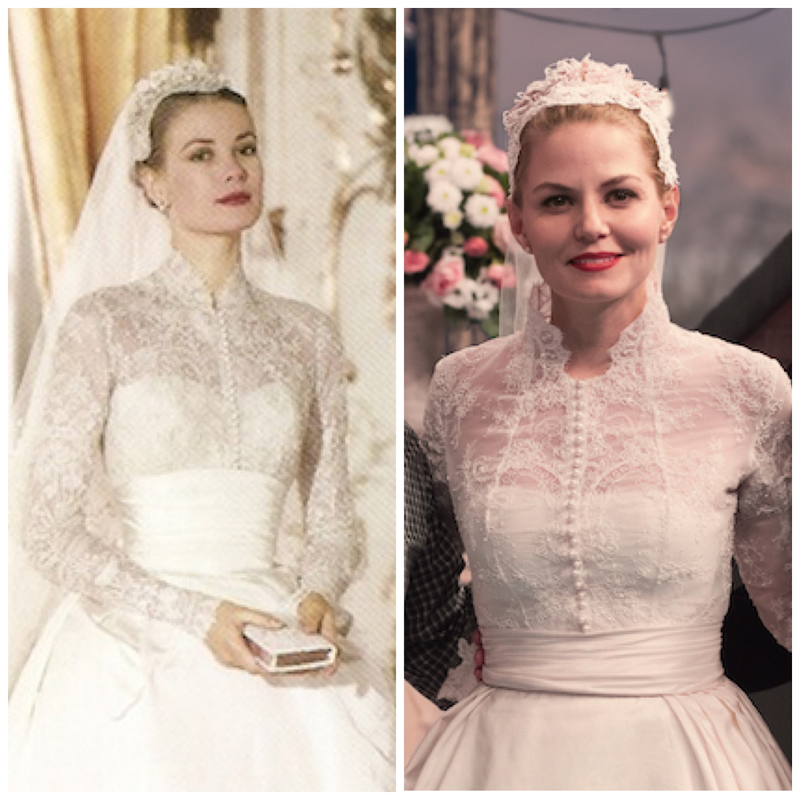 When Emma Swan walked down the aisle in the sixth season of Once Upon A Time this year, her dress was a clear shout-out to Princess Grace. Though Grace Kelly was a real, modern princess, and her acting career was not fairy tale related, her royal status is enough to associate her with fantasy in the minds of viewers. Just as royal weddings inspire TV depictions of fairy tale weddings, the romances of real life royals have inspired entire series. Netflix’s award-winning period drama, The Crown is particularly relevant to Markle, as it’s based on the lives of her future in-laws. The Crown chronicles Queen Elizabeth’s early reign, romance, and family relationships, much of which parallel to the rise of television in the 1950’s. In an incredibly meta fashion, several episodes of the series deal with the strains of living life for the cameras. Elizabeth, who quarrels often with her husband, is caught on film and hurling sports equipment at him in episode eight. When she realizes hovering journalists have caught the whole thing, she manages to convince them to get rid of the film. Her younger sister Margaret doesn’t escape media scrutiny so easily. Both Margaret and her uncle, King Edward VIII, fell in love with divorced people, making their romances scandalous by early 20th century standards. Edward had to forsake his throne in order to marry Wallis Simpson. At least he was fortunate enough to meet and marry her in the pre-TV 1930’s. Margaret’s romance with Captain Peter Townsend played out on television in the 1950’s, and nowadays, Markle and Prince Harry had to camp in Botswana to fall in love in peace. During Elizabeth’s episode five coronation–the first televised coronation in British history–Margaret is caught on camera brushing a piece of fluff from Townsend’s jacket. Video proof of forbidden love? That’s not something Uncle Edward ever had to deal with. After trying and failing for years to secure Elizabeth’s permission to marry Townsend, Margaret ends the relationship herself, as portrayed in the season finale. In the second season, which drops tomorrow (December 8th), Margaret goes on rebound and will eventually have the first televised royal wedding. Though The Crown shows that royal romances don’t always end with a happily ever after, viewers still speak of their unions as fairy tale weddings and want to see royal couples as the personification of true love. If Meghan Markle, a divorced, biracial, American actress, can wed into the royal family, true love and happily ever after are more accessible than ever before. The royal families of Britain and Monaco inspire television shows while also grafting actresses into their family trees. In 2017, the boundaries between fairytale TV and royal reality are coming down. 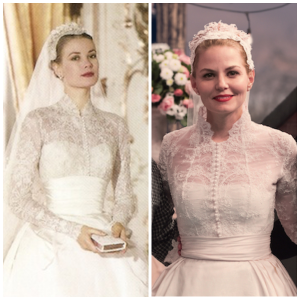 Emma Swan raids Grace Kelly’s closet and Sleeping Beauty is marrying Prince Harry. The Crown made much of Elizabeth II’s historic decision to televise her 1953 coronation, but now audiences expect royal events, including weddings, to be broadcast worldwide. They might not have fairy godmothers or happily ever afters, but that doesn’t stop modern audiences from looking to royals for the real-life embodiment of fairy tale archetypes. This entry was posted in Watching TV and tagged Castle, Fairy Tales in the News, Once Upon a Time, OUAT, The Crown, Weddings. Bookmark the permalink.